Ever wonder what it'd be like to perform at the level of a Drum Corps International group? With fall upon us, corps are now gearing up for their annual auditions for the 2010 drum corps season. Most corps will combine the audition process with "experience" camps that are designed to give prospective members an overview of what it's like to be a member of their organizations. So even if you're on the fence about joining a group, these initial camps can leave you with a great educational experience and prepare you for the future. And with more than 40 World and Open Class corps across the country looking for and catering to performers of many levels, now is the time to start your search! 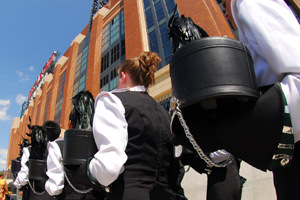 Drum Corps International has assembled a handy Web page to help get you started. Visit DCI.org/audition to find a variety of resources including a list of audition dates and locations, links to additional information about each group, and even an age calculator to help you determine if you are within the eligible range to participate with a corps this summer. Get started today at DCI.org/audition.